The market leading range of Classic drinking bottles for small animals. High strength crystal clear plastic bottles. Fitted with Stainless steel twin ball point sleeve. Gnaw resistant angle cap assembly. 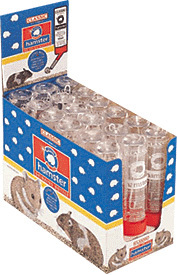 This size is suitable for hamsters, gerbils, mice and small birds and other small animals.